Behold...Julie! And my pseudo-attempt at nail art. :D Julie is a multicolored glitter in a clear base. The glitter is small to micro, which I love. 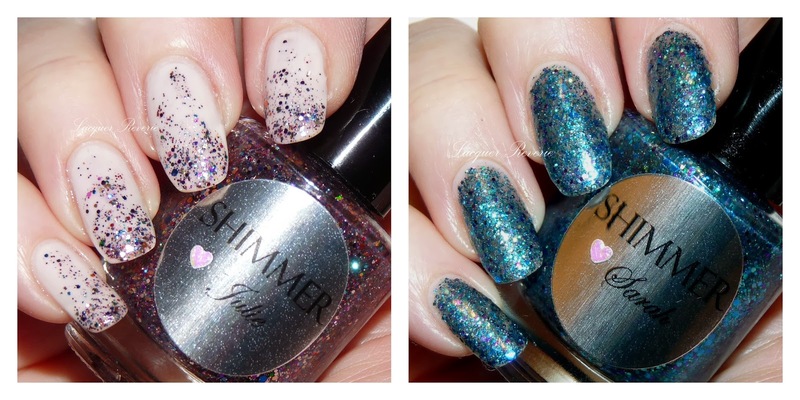 <3 Shimmer Polish describes Julie as a "rainbow mix." Next we have Sarah, or, the Peacock Who Turned Herself Into a Polish. What? You don't remember your mother reading you that classic?? Quite simply, Sarah is a peacock in a bottle...a flawless, fabulous, fine-feathered fowl in one perfect sparkletini!! As with all the Shimmers I've experienced, neither Julie nor Sarah feel like you're wearing glitter polish. A couple of coats of top coat, and there's nothing but a marked absence of lumps and bumps. :) Shimmer Polish can be purchases on Etsy. Stay tuned in the very near future for more shimmery Shimmer goodness. <3 Thanks for stopping by, and have a lovely weekend! :D I know...Shimmers are so gorgeous they should be arrested. :P Oh my goodness...Yadi at Night Swatcher sent me a link to the episode of My Strange Addiction where the girl drank nail polish...have you seen it?? DON'T EAT THE NAIL POLISH, MELISSA!!! STEP AWAY FROM THE GLITTER!!! Okay but seriously, these are fab for the artistically challenged among us/that happen to be us, lool. I like how your gradient extends the length of your gorgeous talons, and I adoooore colorful glitters over pale jellies <3<3<3 Sarah reminds me of a coarser Zoya Crystal (which I still need to wear... I have it in my head as a summer thing for some reason). It's very cool looking and I can only imagine how gorgie it is in person! I am happy to see that video stuck to you enough to not encourage nail polish consumption... wait a minute... LOL <3 Ballet Slippers looks perfect with Julie, and you did a rockin' job with that gradient! (Did I just say rockin' again?) I don't know which is my favorite, because that Peacock-Gone-Princess looks awesome too!! Oh you do tempt me badly here! Both of them are plain awesome! I think I even own the first one... And your gradient is just perfect - like Liesl, I really like how it tinkles to the base of the nail!! LOLOL...you *think* you own the first one?? :P Now that is funny. :D Thank you for the lovely gradient compliment...it really helps my self-confidence in these matters, LOL. Very pretty! I am wearing a Shimmer polish accent nail right now - Melissa ;) It looks great with Zoya Reagan! Yes! You do. I think Melissa is my favorite Shimmer Polish.